From Palm Beach to Richmond, from Las Vegas to Portland, it's not a coincidence, it's a coordinated GOP scheme intended to keep Obama supporters from signing up to vote. While a major element of the Republican National Committee's strategy to game the 2012 elections by affecting who gets to vote and who does not has been cut off at the knees in the wake of a criminal election fraud complaint and other late developments in the still-widening GOP Voter Registration Fraud Scandal, a disturbing and abhorrent nationwide GOP voter registration strategy may have also been revealed by it. The coordinated strategy, as evidenced by recent video documentation emerging from a number of key states, includes registration workers screening out Democratic-leaning voters from registration drives in order to keep them from registering. The way it's done: lying to potential registrants about a "voter survey," rather than disclosing that workers are actually there to register voters -- but only Republican-leaning ones. The deceptive tactic has so far been seen this year in several of the five battleground states where the RNC's controversial, and potentially criminal, $3 million registration program was scuttled late last week after fraudulent registration forms were discovered to have been turned in by a shady firm hired by the RNC to sign up Republican voters in Florida and four other states. The BRAD BLOG has also collected evidence suggesting that the dishonest registration tactic also appears to be in use in states where the RNC's firm, Strategic Allied Consulting, is not said to be operating, suggesting that the practice is not just one used by the discredited firm, but, rather, a nationwide voter scheme by the GOP. Questions about the legality of the tactic are emerging as well, though the deplorable ethics of the practice, legal or otherwise, would seem to be beyond dispute. Election officials in the five states where Strategic was paid some $3 million by the RNC to do voter registration, Florida, North Carolina, Virginia, Colorado, and Nevada, are now said to be in the process of scrambling to review tens of thousands of new and updated voter registration forms submitted by state Republican Parties, as collected by the firm owned by Nathan Sproul, a long-time, notorious GOP operative and paid political consultant of Mitt Romney's campaign. But the disturbing, and seemingly coordinated, tactic of registration workers instructed to misrepresent themselves in order to screen out potential Democratic voters is coming to light as a separate element of the GOP Voter Registration Fraud Scandal. 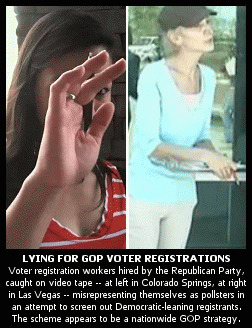 In the very first of our continuing series on the GOP Voter Registration Fraud Scandal last Tuesday, as Palm Beach election officials confirmed to us that the state GOP had turned in more than 100 apparently fraudulent registration applications, we raised the question of whether the FL scheme was tied to a Youtube video out of El Paso County, CO which we'd reported on that morning, after it had gone viral just days earlier. The video shows a young lady serving as a registration worker outside of a Colorado Springs Safeway grocery store, claiming to be "polling people," and asking the woman who caught the encounter on video tape: "Would you vote for Romney or Obama?" The woman knew the young lady was not "polling people," but was registering voters, so she was understandably aghast to discover that the young lady was screening out potential Obama supporters, and appearing to only offer voter registration forms to Romney supporters. When we initially covered the fraudulent voter registration forms turned in by the GOP in Palm Beach County (similarly "potentially fraudulent voter registration forms submitted on behalf of the state GOP" have since been discovered "in at least 11 Florida counties," according to the LA Times) we connected a few evidentiary dots to ask: "Was the young worker in Colorado Springs hired by Strategic Allied Consulting for her work with the local GOP?" The BRAD BLOG subsequently contacted Justin Miller, Communications Director for the CO Republican Party. He confirmed that she was, in fact, working for a third-party contractor hired by the state GOP, though he claimed he did not have the name of the company handy. After promising to get back to us with the name of the company (he never did), on Friday night, FOX31 in Denver "confirmed that the young woman seen registering voters outside a Colorado Springs grocery store in a YouTube video, in which she admits to trying to only register voters who support Mitt Romney, was indeed a contract employee of Sproul's company." We had been immediately suspicious that she had worked for Sproul's group, since they were, by then, reportedly working in Colorado, and since Greg Flynn of BlueNC (who was also the one to discover Sproul & Associates' ownership of the StrategicAlliedConsulting.com Internet domain, before it was then set to "private" in a belated attempt to hide Sproul's fingerprints) had documented Help Wanted ads place in CO and elsewhere, seeking $13/hour workers "interested in helping Mitt Romney win" who would "go to high traffic areas, identify conservative voters, ensure that their voter registration is up to date, and then report back at night with their data and the voter registration forms that they collected." It sounded exactly like what was seen on the CO viral video, and now we know that it was. Strategic was contracted by the RNC to do voter registration in both CO and NC, as well as FL, VA and NV, and "Get Out the Vote" efforts in WI and OH.